Palestine is a headache Saudi King Salman doesn’t need as he confronts rare demands from members of his ruling family that he and his son be removed from power, growing unease about a seven-month old devastating military campaign in Yemen that has caused devastation and mounting civilian casualties, widespread criticism of the kingdom’s handling of the Haj in the wake of a deadly stampede, and concern about the financial and economic management of the kingdom against the backdrop of dropping oil prices. Palestine emerged as a problem that threatened to escalate already high emotions in the kingdom with Saudi Arabia’s national soccer team scheduled to play a 2018 World Cup qualifier against Palestine in the Faisal al-Husseini International Stadium in Al-Ram, a town on the outskirts of Jerusalem. Travelling to Al-Ram would have meant that the Saudi squad would pass through Israeli security, passport and customs controls when it entered the West Bank from Jordan. Doing so would have without doubt fuelled criticism of Mr. Salman’s nine-month old reign; infuriated a deeply conservative, anti-Israeli clergy as well as public opinion that sees the Jewish state as an enemy; and raised further questions about his management that has produced few tangible successes, exposed the kingdom to increased international criticism, and positioned his young, untested son whom many have nicknamed “Reckless” as a powerful defence and economic policy overlord as well as the king’s potential successor. A Saudi soccer team crossing the King Hussein Bridge from Jordan to the West Bank would have been one step to many despite greater Saudi willingness to acknowledge that Israel and the kingdom despite having no diplomatic relations share common interests, particularly with regard to the rise of Iran with international sanctions likely to be lifted as a result of the resolution of the Iranian nuclear crisis. The agreement with Iran has further cemented concern about the reliability of the United States as the kingdom’s foremost ally. The Saudi reluctance to allow its national soccer team to cross an Israeli-controlled border was further complicated by the fact that the United Arab Emirates had no such qualms to allow its team earlier this month to play a World Cup qualifier in Al-Ram, the first such match on Palestinian territory involving a squad from a country with which Israel has no diplomatic relations. The Saudi hesitancy further threatened to undermine Palestinian efforts to use soccer as a way to raise Palestine’s status internationally and project itself as an independent state. World soccer body FIFA, a long-standing pillar of autocratic rule in the Middle East and North Africa, had no misgivings about resolving Mr. Salman’s dilemma. 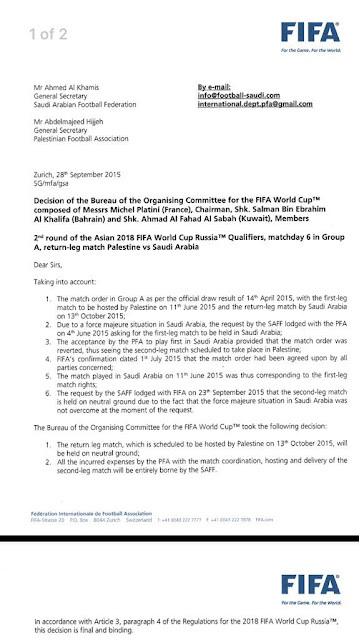 In a letter to the Saudi and Palestinian soccer associations dated September 28, FIFA ordered the Saudi-Palestinian match because of “force majeure” to be moved from Al Ram to a neutral venue. 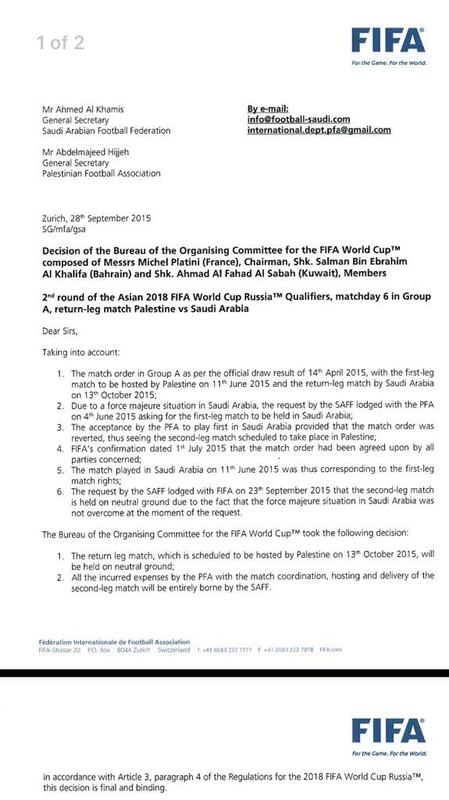 FIFA offered no explanation of what force majeure Saudi Arabia was facing that the UAE did not confront in allowing its soccer team to play in Palestine. In doing so, it appeared to be attempting to spare King Salman, already fighting battles on multiple fronts, a further potentially explosive headache. The FIFA decision was one more marker of the global soccer body’s mockery of its assertion that politics and sports are unrelated. That mockery is evident with just a glimpse of the issues Mr. Salman is dealing with. In an unprecedented move, a senior Saudi prince, a grandson of Saudi Arabia’s founder, Abdulaziz Ibn Saud, this month, called in two letters that have gone viral on the Web for the replacement of Mr. Salman, and his son, deputy crown prince, defence minister and chairman of the Council for Economic and Development Affairs, Prince Mohammed Bin Salman Al Saud. “The king is not in a stable condition and in reality the son of the king [Mohammed bin Salman] is ruling the kingdom. So four or possibly five of my uncles will meet soon to discuss the letters. They are making a plan with a lot of nephews and that will open the door. A lot of the second generation is very anxious. The public are also pushing this very hard, all kinds of people, tribal leaders. They say you have to do this or the country will go to disaster,” the prince who has not been named publicly told The Guardian. The threat to Messrs. Salman and Mohammed was heightened by the king’s refusal to hold anyone accountable for this month’s stampede during the annual pilgrimage to Mecca in which more than 700 people were killed. Angry Saudis have asserted on social media that the incident was the result of rampant corruption in the kingdom. Saudi Arabia’s ruling Al Saud family derive their legitimacy from being the custodians of Islam’s two most holy cities, Mecca and Medina. A Saudi soccer squad playing on the edge of Jerusalem at a time of Israeli-Palestinian clashes around the Al Aqsa mosque, Islam’s third most holy site, would have further put that legitimacy in doubt. Saudis, including many of those in regions bordering Yemen who have tribal and family ties to the war-torn country, are increasingly disgusted at the pictures of the Middle East’s wealthiest country armed to the teeth with sophisticated weaponry reducing the Arab world’s poorest nation to a heap of ruins in a military campaign that has made progress in retaking southern Yemen from Houthi rebels but shows no sign of securing outright victory and producing a viable, unifying Yemeni government. Saudis also criticize what they see as a lack of a military or exit strategy. “This is a war against the Yemeni nation and against Yemen becoming independent. It has no legitimate political foundation and it is not what the people want. Ninety per cent of people in Saudi Arabia don’t want this to happen, exactly the opposite of what the media shows,” said Sgt Maj Dakheel bin Naser Al Qahtani, a former head of air force operations at King Abdulaziz airbase, Dhahran, who defected from the Saudi armed forces last year. With oil trading below $50 a barrel, Saudi Arabia is being forced to borrow and according to the Financial Times has withdrawn some $70 billion from overseas investments. Saudi Arabia’s stock market index has dropped 30 percent in the last year. The International Monetary Fund (IMF) predicted Saudi Arabia would next year have a budget deficit of at least $107 billion. Saudi Arabia’s budget is based on a $90 a barrel oil price. The kingdom is believed to need a $110 a barrel price to balance its budget given the costs of the wars in Yemen, Syria and against the Islamic State, the jihadist group that controls a swath of Syria and Iraq. Pictures of Saudi soccer players subjecting themselves to Israeli controls potentially could have been the cinder that put the House of Saud on fire where it not for the willingness of Sepp Blatter’s FIFA fire brigade to come to Mr. Salman’s rescue on what can only be opportunistic political grounds. Inevitably, the mass exodus of refugees from conflict areas was going to provoke the spilling into Europe of multiple disputes in the Middle East, Central Asia and Africa. 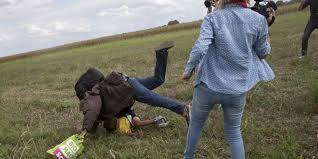 Spanish soccer is the first to feel the weight of the baggage that has turned vast numbers into destitute refugees. Kurdish rebels have accused a Syrian coach who was hired earlier this month by Real Madrid after having been tripped on camera by a Hungarian camera woman as he was running towards the border a child in his arms of being an Al Qaeda fighter and the instigator of a deadly anti-Kurdish soccer brawl. The allegations raised by the Syrian Kurdish Democratic Union Party (PYD), believed to be associated with the Kurdistan Workers Party (PKK) that is locked into escalating hostilities with Turkey, are serious. PDY media asserted that Osama Abdul Mohsen, the coach who landed in Spain, had been a fighter for Jabhat al Nusra, a major Syrian jihadist militia aligned with Al Qaeda. The PYD and a Syrian Christian Facebook page charged further that Mr. Abdul Rahman had recently revived his Facebook page but had deleted the Nusra flag which in the past had been his cover photo. Also allegedly removed from the page were references to Mr. Abdul Rahman having fought against Kurdish forces in Amudeh, Serekaniye and Afrin. “Osama Abdul joined the rebel groups in 2011 and committed crimes against civilian minorities, including Kurds,” the PYD said in a statement. The PYD suggested further that Mr. Abdul Rahman had left Syria on a journey that put him in the spotlight in Hungary and propelled him to Spain after Kurdish forces captured in July the Syrian town of Tel Abyad where he and his family lived. Kurdish resentment of Mr. Abdul Mohsen, who was the coach of al-Fotuwa SC in Deir Ez Zor from 2004-2010, appears heightened by allegations that he was one of the instigators of a soccer brawl in 2004 in the predominantly Kurdish city of Qamishli during which Syrian security forces killed at least 50 Kurdish protesters. The allegations raise serious policy questions for European governments. An unknown number of refugees may well have been fighters at some point in the past 4.5 years of groups that are proscribed in the West. Some sources suggest that Mr. Abdul Rahman had been arrested and tortured by forces loyal to Syrian president Bashar al-Assad early on in the war. Many may have felt they had no choice in a brutal civil war rather than having opted to join groups like Nusra for ideological reasons. That is all the more true in a situation in which Western efforts to create more moderate rebel forces have failed miserably. The failure has prompted efforts by Qatar to bring Nusra in from the cold and sparked creeping suggestions in the West that Nusra in the fight against the Islamic State may be the lesser of two evils. To be sure, determining who is who in the human mass that has swept on to the shores of Europe is no easy feat, Nonetheless, the PDY allegations are likely to be grist on the mill of East European opposition to accommodation of the refugees that is often laced with racism and conservative and right-wing West European politicians and groups with long-standing reservations about immigration. Intelligence agencies have further warned that some jihadists may slip into Europe with the refugees. German intelligence said this week that the number of Islamic extremists in the country had increased sharply in recent months and expressed concern that they were recruiting among refugees. There is no immediate way of checking the PYD’s allegations, but both Syrian and Kurdish rebel groups as well as the Assad regime have a vested interest in trying to stymie the exodus from areas that they control. They both fear that their regions could be depopulated and that their ability to recruit fighters would diminish. The PYD is reported to have barred Kurds in at least one area under its control, Efrin, from travelling to Turkey, a gateway to Europe. A PDY rival, the Kurdish National Council (KNC) earlier this month organised protests against migration in Hasakah province. KNC officials said they feared Kurdish demands for autonomy, if not independence, could be undermined by demographic changes as a result of an exodus of Kurds. Similarly, the Assad regime opposes migration because it further undermines its legitimacy. Real Madrid and Mr. Abdul Rahman have yet to comment on the allegations levied by the PYD. Irrespective of their accuracy, the allegations raise multiple issues that go beyond security considerations. Mr. Abdul Rahman hails from an environment that was tough even before civil war erupted in Syria. The more damning PYD assertion is his alleged involvement in the soccer brawl that occurred long before the civil war and was designed to suppress Kurdish demands for legitimate rights rather than his association with Nusra in a situation in which people often have to make difficult choices. Nonetheless, Mr. Abdul Rahman should also respond in chapter and verse to his alleged association with Nusra. The question, however, what if, remains. Sending Mr. Abdul Rahman and his family back to Syria and retaliation by either the rebels or the regime is not an option. The real lesson is that refugees’ baggage is a mixed bag of the disputes that persuaded them to leave their home countries as well as choices they made in conflict situations. It’s easy to judge them from an armchair, but doesn’t solve the issue of what consequences that judgement should have. Gleaming glass skyscrapers, state-of-the-art technology, and wealthy merchant families have replaced the Gulf’s muddy towns and villages populated by traders and pearl fishers that once lacked electricity, running water or modern communications. The region’s modern day projection of a visionary cutting- edge, 21st century urban environment masks however the fact that some things have not changed. Gulf states continue to be ruled by the same families, generation after generation. The families have become what an Emirati regime critic, Yousif Khalifa al-Yousif, termed “an institution of entitlement.”1 Alongside autocrats, the region also remains home to holy warriors and modern-day pirates. The principle of governance that what is good for business is good for the village-turned-nation still guides rulers who rank among the region’s foremost businessmen. If, however, the region’s physical transformation speaks to an almost unitary vision of modernity, its politics tell a very different story, one of deep-seated social conservatism despite concessions in some states to cultural attributes of expatriate communities, resistance to political change, and a clinging to the status quo at whatever price. Close tribal ties, intermarriage between ruling families and an intertwining of tribal economic relations compensate for weak institutionalization. Concepts of conflict of interest are moreover blurred with little distinction between the economic and commercial interests of the state and those of ruling families. Dubai’s foremost governing institutions, ruler Sheikh Mohammed bin Rashid Al Maktoum’s Executive Office, his private staff, and his Executive Council or Cabinet operate in obscurity with no clear legal anchor. Demands for institutionalization and transparency reflect far more fundamental changes that Gulf leaders have to come to grips with. Those changes are driven by populations that in majority are under the age of 30, oil and gas revenues that in the medium term will be unable to sustain rulers’ cradle-to- grave social contract with their populations, and communication technologies that render censorship and non-transparency increasingly meaningless. They guide former US ambassador Gary A. Grappo’s description of the environment that ailing Omani Sultan Qaboos bin Said’s successor will encounter, but are equally true for all Gulf leaders. That vision, Grappo argued, would have to involve gradual liberalization including a greater devolution of decision-making authority to a consultative council, allowing it to prepare and approve budgets; greater press freedom and transparency; lifting of restrictions on civil society organizations; economic diversification; and inclusion of minority cultures in the preservation of Omani culture. Grappo’s prescriptions are applicable across the Gulf. His list is easily expandable to include notions of a gradual transition from absolute to constitutional monarchy, decriminalization of non-violent opposition activity, and social and economic policies that are inclusionary. Grappo’s vision entails the kind of boldness and risk taking that has become the trademark of Dubai’s ruling Al Maktoum family in the last two centuries but has yet to be applied to the challenges facing today’s rulers in the region. For now, Gulf rulers have sought to fine tune the status quo by casting themselves in the role of protectors of national and tribal identity, traditions and heritage; projecting themselves as agents of the transition from energy-driven to post-oil and knowledge-based economies and of greater independence by asserting themselves politically and militarily; and seeking to enhance their countries’ international status by hosting mega events like the 2020 Expo in Dubai and the 2022 World Cup in Qatar. To be sure, the need to prepare for a post-oil era in the Gulf is immediate. Newly born in all Gulf states with the exception of Qatar and Kuwait are expected to witness their countries running out of fossil energy resources within their lifetimes.4 That gives rulers at best several decades to diversify their economies – a transition that involves more than simply developing new economic sectors. It will require revamping education systems to match labour supply and demand; motivating citizenry to depend less on government jobs, handouts and subsidies; streamlining bureaucracies; and rewriting social contracts already threatened by fiscal tightening. Looming in the back of the minds of Gulf leaders is the memory of Algeria where a collapse in oil prices in the 1980s put an end to the social contract. Protests erupted as incomes dropped and inflation and unemployment increased. The country slipped into civil war that ultimately ended with a revival of the social contract on the back of rising oil prices. Gulf leaders look to Singapore, a city state that has developed within a matter of decades from an impoverished island with no resources into a first world state and global hub with a highly diversified economy, as their model. It is a model that combines authoritarianism with empowerment. Delegations from the Gulf travel to Singapore to discover the secret of its success and enlist Singaporean institutions to assist them in developing for example education systems. The UAE, home to 200 nationalities, unlike countries like Saudi Arabia and Bahrain has adopted one aspect of Singapore, traumatized by its expulsion from Malaysia in the 1960s and race riots at the time that few analysts have focused on: the building of a society that sees diversity as an asset and respects different cultures and faiths. Like Qatar, the UAE recognized that tight political control did not preclude the building of a society whose cultural and racial tolerance is steeped in Islam in an effort to ensure domestic stability and counter extremism. Up to a third of the UAE’s population is non-Muslim. Emirati writer Maria Hanif recently compared the UAE to Al Andalus, the Islamic empire in Iberia established in the 8th century that has become a reference point for Muslim tolerance, pluralism and the productive and harmonious interaction of Arabs, Jews and Christians. Politics on the other hand weaves a tale of regional rivalries and leaders’ different visions of how to balance modernity with social and political conservatism and how to ensure regime survival and maintain a regional security environment which is dependent on a US defence umbrella that is increasingly perceived by Gulf states as unreliable. Compounding the region’s leadership challenge is the progressive breakdown of a social contract based on a cradle-to-grave welfare state that assists citizens even in the cost of getting married in exchange for surrender of political rights. For more than a decade Gulf leaders starting with the late King Abdullah of Saudi Arabia have been nibbling away at the welfare state in a bid to rationalize government finances and foster national identity. Cloaked in elegant traditional flowing robes and head dresses, Gulf leaders project an image of conservatism and adversity to risk. Yet, risk is at the core of their varied leaps towards modernity fuelled by phenomenal oil and gas revenues and a bid to fend off pressure for change that informs Saudi, Emirati and Qatari visions of the future rooted in late 18th and early 19th century tribal leadership. Some risks and threats are inevitable in the drive for modernity such as the influx of expatriates and migrant labour that has turned the region’s demographics upside down and raised questions of societies’ sustainability and viability for which there are no good answers. Others are the immutable result of restrictive and discriminatory policies that have transformed popular revolts into battles ranging from inflexible attitudes towards naturalization, low-intensity conflict in Bahrain to civil war in Syria; given holy warriors like the Islamic State a new lease on life; driven sectarian tensions that have sparked wars in Iraq and Yemen; and fuelled discontent among majority and minority populations alike. Gulf leaders’ hopes that violence and brutality that followed most of the 2011 revolts coupled with their determined counterrevolutionary strategies at home and abroad would cow restless populations were dashed this summer. Mass anti-government demonstrations erupted in Lebanon and Iraq demanding an end to corruption and improved services and lowly paid policemen and tax authority officials protested in Egypt, a mainstay of the Saudi and UAE-backed regime of general-turned-president Abdel Fattah Al Sisi. Similarly, there is little reason to assume that Gulf states despite successful co-optation and repressive policies are immune to anti-government protest. Bahrain, Oman, Kuwait and Saudi Arabia witnessed mass demonstrations in recent years. Gulf youth have said in surveys that democracy was a top priority for them even though recent developments have dampened their hopes.11 Financial muscle has allowed several Gulf states to buy precious time with generous handouts but reduced oil revenues forcing economic rationalization spotlight the fragility of such safety valves. Nothing highlights the need to broaden the focus of vision and leadership in the Gulf like the region’s lack of inclusiveness, incapability and unwillingness to address what some analysts describe as a ticking time bomb: the Bidoun or Without, hundreds of thousands of predominantly Gulf Arabs who are denied citizenship despite having often populated the rank of file of national armies. Most are Bedouin from the region with a sprinkling of migrants from Iran, Iraq and Pakistan who destroyed their documents in a failed bid to ensure that they would be granted citizenship as Gulf states achieved independence. Kuwaiti media reported that 13 of the 29 people arrested in the wake of the attacks were Bidoun. The Islamic State claimed responsibility for the attack.14 Afraid to single out the Bidoun, Kuwaiti officials and analysts were quick to identify Bidoun involvement as part of a broader process of radicalization among Sunni Muslims. Gulf leaders face identical problems and share similar visions of their place in the international community. Yet, their strategies to get from A to B, approaches to notions of national and regional security, perceptions of development, and responses to domestic and international criticism vary widely. The differences in vision range from the economic and commercial brashness of Dubai, to Qatar’s well thought through but poorly executed soft power strategy, to Saudi Arabia’s high-risk use of financial and military muscle supported by the UAE’s increasing projection of itself as a regional military power. In projecting itself militarily, the UAE benefitted from having participated in virtually every U.S.-led coalition campaign since 1991. Beyond demographics, other limitations of the varying visions are also becoming increasingly obvious. Abu Dhabi had to bail out Dubai’s real estate driven model when the emirate in 2008 suffered the world’s steepest property slump with home prices dropping 50 percent and had to reschedule some $120 billion in debt. The bail out together with the collapse in 2013 of low budget airline Bahrain Air also raised long-term questions about the Gulf’s fundamental business model in which the state is the primary economic driver. Gulf airlines have emerged as major players in aviation benefitting from the region’s geography as well as its ability to profit from changing patterns in international trade and politics. The Dubai bail out highlighted the different visions of the emirate and Abu Dhabi visions and the dynamics of the power relationship between the two key states in the UAE. Rather than opting for Dubai’s brashness, relative autonomy and commercial drive, Abu Dhabi relies on the creation of a military-industrial complex, nuclear and renewable energy programs, and its wealth to cement its dominant position in the federation, and ensure its ability to project regional and international power. Meanwhile, Qatar’s successful effort to host the 2022 World Cup has with US and Swiss legal investigations into the integrity of its bid and widespread criticism of the Gulf-wide migrant labour kafala or sponsorship system that puts employees at the mercy of their employers turned into a public relations nightmare. Saudi Arabia’s harsh justice system with its public beheadings, its war in Yemen that is bombing the Gulf’s poorest nation into even greater abject poverty, and its puritan interpretation of Islam that deprives women of basic rights has made it all but a pariah state tolerated because of its financial largess and geo-strategic importance. Compounding the downside of the varying visions are the budgetary consequences of expensive hard and soft power strategies at a time of dropping oil prices that raise the spectre of budget deficits and are forcing Gulf states to nibble at the edges of the cradle-to-grave welfare state that underwrites relative social peace. The IMF estimates that falling global oil prices will cost the Gulf an estimated $380 billion in export earnings this year. Dubai’s vision is in your face. Superlatives are its trademark. Its skyline boasts its rulers’ long-standing knack for bold decisions and an insatiable and unashamedly ambitious drive to implant itself in the mind of every one of the world’s 7 billion inhabitants developed by Sheikh Rashid bin Saeed, the current ruler, Sheikh Mohammed Bin Rashid’s father. The list of Dubai’s biggest, best, the richest, newest, most luxurious, most over the top, and most expensive projects is long. It includes the world’s biggest mall, indoor ski slope, artificial islands, the world’s tallest building and largest man-made port, the largest ever New Year’s fireworks and LED screen, the world’s only seven-star hotel, the Middle East’s top financial centre and plans for the world’s largest amusement park and even larger indoor ski facility. Nothing seems to bold or outrageous as long as it fulfils Sheikh Rashid’s vision of keeping Dubai Inc. in the global public eye. Catchy slogans and slick advertising and public relations put Dubai on the world map. Much of Dubai's contemporary model is rooted in history. Sheikh Rashid's bold notion of 'build and the will come' anticipated British tycoon Richard Branson's principle of 'screw it, let’s do it.' In doing so, Rashid set a template for development that has been to a large degree adopted by the Gulf flush with oil money after the 1973 oil crisis. “In Sheikh Mohammed’s mind, the way to do things is by nature and by natural law. Things take their natural order. If he planted trees in Dubai, if he offered opportunity, people would stop in Dubai. Sheikh Mohammed came from a large family. He had to find his own place and did that with natural opportunity,” the person close to Sheikh Mohammed said. The very presence in Dubai of the Maktoums signalled their knack for bold gambles that more often than not have paid off over the past two centuries. Unhappy with internecine tribal infighting initiated by their cousins and later rulers of Abu Dhabi, the Al Nahayans, the Maktoums decamped in the first half of the 19th century from their ancestral oasis of Liwa and headed for an forlorn fishing village on the coast.21 There was then little reason to assume that Dubai would serve as a useful base, let alone become a 21st century, hyper-modern global hub. The Maktoums took their bold gamble a step further when in the late 1890s and early 1900s they laid the foundations for Dubai as a free port by abolishing customs, tariffs and vessel licensing in a move that was also designed to ensure that Dubai would serve as the anchor for Britain's colonial presence in the Gulf. The moves gave Dubai an edge over Iranian-controlled ports on the Arab side of the Gulf that had imposed taxes to provide revenue for a cash-strapped Iranian administration. In contrast to today, the Maktoums like other Gulf Arabs at the time embraced the Bedouin ritual of hospitality for strangers irrespective who they were. Migrants, unlike modern day expatriates and migrant labour, were encouraged to make Dubai their permanent home rather than accept an arrangement that ended with their departure once they had fulfilled their contractual obligations. At the time, the Maktoums recognized the multiple benefits of migration. It was a lesson they had learnt from their own migration from Liwa. Migrants were the stuff that would make Sheikh Rashid's dream a reality. They were an asset, one that Dubai was eager to hold on to, not the necessary evil utility that the Gulf tolerates today because it has no choice but sees as a threat to the region's identity and ultimately to rulers' hold on power. Dubai and with it the Gulf, however, owes a debt to the Iranians whose outward looking worldview, African and Asian networks, and modern technology, helped set the remote fishing village on an unparalleled path to modernity. Later waves of migration were welcomed but offered less benefits, foremost among which the option of legally secured, permanent integration into society. Dubai benefitted from both pre- and post-revolution IranIan policies. Its economy thrived on its competitive free-wheeling, free market policies as opposed to the red tape and financial burdens imposed by Iran. Since the Iranian revolution, Dubai has become home to more liberal Iranians seeking to escape the strictures of the Islamic republic. Iranians today rank among Dubai's foremost merchant families, largest developers and major investors while Iran is one of the emirate's foremost trading partners. Much like today’s migrant workers, the Iranians and the next wave of migrants, the Indians, fulfilled economic roles that Dubai's local population was too proud to embrace. The Gulf’s different styles of leadership are reflected in the way states project themselves. Saudi Arabia wears secrecy and conservatism on its sleeve. Brash and aggressive, Dubai trumpets its status of being a modern, forward looking global city. It boasts being a multicultural metropole. Qatar basks in controversy over its idiosyncratic, counter intuitive foreign policy that forges relations with friend and foe alike, yet squirms when it is cast under the spotlight. For much of their recent history as independent states, Gulf nations expressed leadership in employing vast amounts of oil and gas revenues to build relations anchored on their alliance with the United States with countries across the globe; turn their backwaters into architectural landmarks and business hubs through investment in infrastructure and exploitation of their geostrategic location; high profile investments in Western real estate and global brands; and the creation of a limited number of world class global businesses that include Saudi Arabia’s national oil company Aramco and Sabic, its petrochemical industry; Qatar Gas and Qatar Airways; Dubai’s global port manger DP World, Emirates Airlines and Etisilat telecommunications company; and Abu Dhabi’s Ettihad airline. Increasingly however, concepts of leadership particularly in the smaller Gulf states have been challenged by regional threats such as the 1990 Iraqi invasion of Kuwait, the fallout of the 2003 US invasion of Iraq, the more recent wave of popular revolts that in 2011 toppled four Arab leaders and sparked a civil and proxy war in Syria, the rise of political Islam, and the emergence of the Islamic State that with its eradication of the borders between Iraq and Syria and pan-Islamist ideology that threatens the notion of the nation state as the basis for regional order in the Middle East. Leadership concepts have also been challenged by a wearing thin of the strategy of talking the talk but not walking the walk. Restless populations have for now been cowed by the crushing or reversal of most of the successful revolts and intimidated by violence engulfing the region and harsh crackdowns on domestic dissent. Yet, discontent simmers at the surface while minorities chafe at continued discrimination and disenfranchisement. The rise of Islamic State and the wave of violence and brutality has moreover focused international attention on root causes that include sectarian and intolerant ideologies as well as a lack of inclusiveness and public space for dissenting political expression. The downside of autocratic visions of leadership that have yet to come to grips with the shadow side of break speed development have further been brought into sharp relief with the Gulf’s restrictive labour regime moving centre stage with Qatar’s successful bid for the 2022 World Cup hosting rights. The World Cup represented Qatari vision that differed fundamentally from that of Dubai but was no less bold and audacious. If Dubai’s approach was commercially-driven, Qatar’s was politics per se. If Dubai’s was creating a commercial and economic hub that would rank among the world’s top global cities while preserving the regional status quo, Qatar’s was embracing political change everywhere but at home. Qatar signalled its intentions with the launch in 1996 of the Al Jazeera television network, the freewheeling airing of news and opinions that were banned from a regional landscape dominated by staid state-run television stations that never veered away from government directives. Within a matter of years Al Jazeera had become the Middle East’s most popular Arabic-language television station, forcing an irreversible rewriting of the region’s media landscape. It matched the success of Al Jazeera with its strategic alliance with the Muslim Brotherhood, fending off severe Gulf pressure to change its policy; several high profile not always successful efforts to mediate regional conflict in Lebanon, Afghanistan and Darfur; and a strategic attempt to make sports a pillar of national identity and Doha a global sports hub with the World Cup as its crowning success. The vast difference in Emirati and Qatari responses to multiple challenges was evident in their responses to international pressure to reform their restrictive labour regimes. The responses also defined the degree to which human rights and labour activists have been able to leverage an environment in which pressure on Gulf leaders is mounting to match words with deeds. That is not to say that Sheikh Mohammed is insensitive to the criticism. On the contrary. He finds it embarrassing and a stain on Dubai’s reputation, according to people close to him. “Dubai seeks to project integrity. It’s not like Qatar that feels that any news including bad news is good news. Qatar doesn’t mind being vilified,” one person said.24 Yet, at the same time Dubai like Abu Dhabi does not want to be seen to be caving in to external pressure. In contrast to the UAE, Qatar decided that offence was its best defence. In a break with Gulf’s long- standing refusal to engage and policy of stonewalling, Qatar welcomed its critics in constructive dialogue. It also promised greater transparency. Representatives of Amnesty International and Human Rights Watch were granted entry, access to officials and labour camps, allowed to hold news conferences and launch damning reports in Doha, and major Qatari institutions worked with them to develop internationally condoned labour standards. The Qatari effort demonstrates nonetheless the degree to which Gulf states no longer can get away with going through the motions and statements designed to mollify critics that are not backed up by the fulfilment of their promise. Four years of Qatari engagement that have produced little more than lofty promises of labour reform enshrined in glossy documents are starting to turn counterproductive as even minimal change prove difficult to implement. Transparency is nowhere to be found. Rather than providing chapter and verse on its controversial World Cup bid in an effort to counter mounting evidence of bribery and wrongdoing, Qatar has limited itself to issuing a string of denials, plain vanilla assertions that it upholds the highest standards of integrity, and promises to cooperate with any and every investigation. Enquiries into details of the awarding of World Cup-related contracts, including who submitted competing bids, and the grounds on which winning consortia were chosen are stonewalled with statements consisting of platitudes and unrelated detail on the provision of comfortable housing for workers involved in the construction of stadia. Qatar’s failure to live up to its promises is exasperating the United Nations’ International Labour Organization (ILO) as well as human rights and labour activists and undermining whatever goodwill the Gulf state had achieved. Despite growing doubts about Qatar’s sincerity, its hosting of the World Cup still holds out the promise of being a rare sporting mega event that leaves a legacy of social and economic, if not political change rather than a mountain of debt and a slew of white elephants. If so, it would demonstrate the kind of bold, risk taking leadership and vision that matches that of the Al Maktoums. Pressure on Qatar to move forward with implementation of its promised reforms has further persuaded all the region’s states to tinker in one way or another with their labour regimes. Kuwait’s parliament has gone the furthest with the passing of a bill that grants rights to domestic servants. Kuwait also became the first Gulf state to open a refuge for female migrants. At the bottom line, Gulf states are discovering what Europe realized in the wake of the wave of Gastarbeiter or foreign workers they invited in the 1960s to accommodate an expanding labour market in the belief the workers would eventually return to their home countries. They didn’t and eventually were joined by their families. In the Gulf, it is middle class expatriates rather than unskilled and semi- skilled labour who are striking social roots. The young man is unlikely to risk family and fortune to stand up for his rights. Yet, his is a widespread, largely unspoken sentiment that cannot simply be ignored or allowed to fester until a time when circumstance makes turning it into a public demand either opportune or inevitable. Gulf leaders are also discovering that gleaming high rises, eight-lane freeways, and glittering shopping malls hosting luxury brands; paying lip service to modernization; and buying foreign talent allows them to project their conservative, autocratic societies on the cutting edge of creativity and inn ovation for at best a limited period of time. Much of Sheikh Mohammed’s requirements can be acquired. The environment is where he and other Gulf leaders feel the squeeze. Dubai’s Media City is home to the global and regional headquarters of the world’s major media houses. Efforts to add creativity and innovation to the concept of a real estate- driven media hub faltered however on legal restrictions, physical environs and lack of a creative, intellectual environment. Consultants hired to help Dubai make the transition advised the government that to achieve its goal it would have to broaden freedoms of expression, allow foreigners greater professional mobility, and create a physical environment that encourages the kind of creativity not found in modern office blocks. Rather than liberalizing, institutionalizing and seriously rationalizing, Gulf states have in recent years tightened the reigns as they seek to insulate themselves from regional volatility, maintain market share in rapidly changing energy markets, fend off jihadist threats, fight proxy wars and with limited success assert themselves militarily in a bid to shape the Middle East in their mould, and all of that as budgets shrink and oil prices tumble. The jury is out on whether the strategy will work. 2015 has turned out to be a difficult year for Gulf leaders. The US-fostered agreement with Iran to resolve the nuclear crisis promises to be a mixed bag. Countries like the UAE expect an initial economic boon but the agreement returns to the international fold one of the Middle East’s most powerful nations whose system of governance is rooted in political Islam and whose policies are diametrically opposed to those of many of the Gulf states. The wars in Yemen, Syria and Iraq and to a lesser degree Libya constitute powerful threats that have highlighted the limitations of military forces flush with some of the world’s most advanced hardware but hampered by reluctance to commit ground troops in large numbers, a longstanding rulers’ distrust of armed forces capable of staging a military coup, and a tradition of wielding financial rather than military muscle. Saudi and UAE support for Al Sisi’s military coup in 2013 that toppled Egypt’s first and only democratically elected president has produced one of the region’s most repressive dictatorships. Al Sisi’s brutal crackdown on all dissent has fuelled an insurgency that is spilling out of the Sinai desert into Cairo and other major Egyptian cities. Emirati special forces, widely viewed as the region’s best after Israel as a result of a decade of UN peacekeeping experience, have earned praise for their performance in Yemen in support of Saudi-led efforts to defeat the rebel Houthis in Yemen and return exiled president Abd Rabbuh Mansur Hadi to power. The inclusion of a woman fighter pilot in the first UAE raid on Islamic State targets as part of the US- led coalition offered the Emirates a picture perfect opportunity to project itself as a nation on the cutting edge of modernity. The Emirati air force demonstrated its potential reach in attacks in cooperation with Egypt on Islamist targets in Libya that did little to change the balance of power between rival forces in the North African nation. Yet, undeterred by the military campaign against it, the Islamic State is entrenching its alternative, harsh governance structures that not only challenge Gulf rulers’ vision of leadership but also their notions of the nation-state as opposed to an irredentist, expansionary pan-Islamist entity and is able to threaten domestic stability with attacks that target security forces and Shiite Muslim minorities. Yemen despite major military advances in southern Yemen threatens to become the conservative Gulf’s Vietnam. Retaking northern Yemen and the capital Sana’a where the Houthis enjoy greater support than in the south is likely to prove more difficult. And military victory may prove difficult to translate into sustainable political achievement. Saudi-led Gulf interference in Yemeni politics lies at the core of problems in a nation in which many blame the Gulf states for having bombed them back to the Stone Age in a six-month long air campaign that has wreaked humanitarian havoc. Political differences are compounded by a fundamental tension inherent in the region’s security architecture: several of the smaller Gulf states have resisted militarization of the six member Gulf Cooperation Council (GCC) comprised of Saudi Arabia, the United Arab Emirates, Qatar, Bahrain, Kuwait and Oman, fearing Saudi dominance. Gulf leaders’ divergent views of regional security echo far beyond the Gulf, home to a vast US military infrastructure designed to ensure security that includes the Bahrain base of the Fifth Fleet, which patrols the Gulf and accesses facilities in various littoral states; Camp Arifjan in Kuwait that serves as a logistics base for US operations against the Islamic States; the Al-Udeid air base in Qatar, the largest U.S. air base in the region; and access to air base facilities in Oman and the UAE as well as Saudi airspace. Alawi’s comments and repeated reluctance by various smaller Gulf states to join past GCC military operations bodes ill for the creation of a Gulf military command announced late last year. The command would involve a force of several hundred thousand soldiers capable of responding to regional threats that include militant Islamists and rival Iran. More threatening than the economics is the fact that the social contract on which autocratic Gulf rule is based is fraying at the edges and has been for more than a decade. The last time that happened was at the turn of the century when Saudi gross national product (GNP) per capita was at $7,700 less than half of what it had been 20 years earlier and the kingdom encouraged frustrated young men to join the anti- Soviet jihad in Afghanistan. Things never got that bad in the UAE where male Emiratis receive some $55,000 a year in subsidies that include free land, healthcare, water, and education that can include degrees at Western universities; cheap electricity, and subsidized food and gasoline. In addition, Emiratis pay no income or property tax. Yet, even the UAE sees itself forced to rationalize in line with IMF advice. The UAE in July tied petrol prices to world market prices leading to a 30 percent hike at the pump and prices that were only 13 cents below the American retail price. The hike tackling cheap petrol, which many Emiratis see as a birth right, did nothing to rock the boat but like Abdullah’s measures more than a decade ago constituted writing on the wall. Oman and Kuwait, which backed away from raising diesel and kerosene prices in January following a public outcry, were quick to announce that they had no intention of following in the Emirates’ footsteps. Ironically, tax regimes of various sorts do not simply challenge leaders’ concepts of absolute power. They also make regimes dependent on their expatriate populations not only for their labour but also their contributions to the coffers of the state and they grant leverage to a business community that historically was reliant on government. The fraying of the Gulf’s traditional social contract poses not only a threat but also an opportunity to ensure regime survival. While it inevitably will provoke a restructuring of the relationship between rulers and ruled, it offers leaders with vision an opportunity to grab the bull by its horns. That would have to involve the kind of bold and gutsy moves that Dubai’s Al Maktoum’s and Qatar’s Al Thanis have made their trademarks. For now, with crackdowns on freedom of expression and dissent Gulf leaders’ vision appears one of salvaging the status quo rather than managing political transition. Amid the growing doubts about US reliability, China looms large as a model of achieving extraordinary economic performance while maintaining tight political control. It’s a model that seeks to suppress inevitable demands for greater sharing of power and resources and risks exacerbating fault lines that include divides along sectarian lines, between urban and tribal communities and between regions within the borders of various Gulf states. Yet, the jury is still out. It’s not what Qatari leaders had in mind when they submitted their bid for the 2022 World Cup but the tournament despite feet dragging on promised reforms could prove to be a Trojan horse that drives change. As could the overall strategy of countries like the UAE and Bahrain to project themselves internationally through the hosting of major sporting events and the acquisition of big name clubs and other assets. Initial signs of change, the product of pressure not only by FIFA and human rights and labour activists but also Western governments and corporations, go beyond Qatar’s engagement with critics. They remain tentative and have yet to be bolstered by robust legislation and implementation but are sparking a process that is likely to be irreversible, take on dynamics of its own that Gulf regimes may find hard to control, and is part of a growing realization in the region that it cannot escape global demands for greater transparency and accountability. They also keep open the promise that enlightened leadership can manage the process. Leaders of Dubai and UAE have in as yet small ways signalled that they are not oblivious to the winds of change that are sweeping the Middle East and North Africa even if they have yet to wholeheartedly get in front of the cart. One indication are reports that Qatar has approved the creation of an independent soccer players union, the country’s first trade union and a move that could open the door to a more radical restructuring of its labour system. Another is the decision by traditionally secretive, major state-owned companies such as Qatar Airways and the Investment Corporation of Dubai ICD) that owns Emirates airlines among other of the emirate’s crown jewels, to publish their results for the first time to counter criticism by Western governments and airlines of unfair competition and restore investor confidence. A third indication was Qatar Airways’ recent lifting of restrictions on pregnancy and marriage for its female personnel in response to criticism by the ILO, the UN labour organization.48 The airline said it was also reviewing rules that impose curfews on women and do not allow women to be brought or picked up from work by men who are not family of theirs. Similarly, women in Saudi Arabia, the Gulf’s most restrictive nation, were in August allowed to register for the first time for municipal elections scheduled for December. Labour reform presents leaders an opportunity to project themselves as agents of inevitable change and foresighted adaptation to new realities. It is low hanging fruit because it does not involve the granting of political rights and would take the sting out of the most immediate criticism of Gulf leaders and project them as enlightened rulers. Yet, at the same time labour reform is as tricky and potentially treacherous as political reform. It involves managing what are legitimate, existential fears among the region’s citizenry about a future in which demography threatens their ability to maintain indigenous control of their culture and societies. The cost of cheap unskilled labour is magnified by the fact that it offers little incentive to governments to develop economic policies that encourage the private sector to focus on exports. Business opts instead for low-tech, labour intensive products for a domestic market and shies away from the higher risk investments in human capital, facilities and innovation that would allow companies to compete internationally. The aluminium and petrochemicals sectors although they only marginally contribute to diversification because of their dependence on oil are the exception that demonstrate Gulf countries’ ability to compete if the right policies are adopted. If the Gulf was ever in need of vision and leadership it is in the forthcoming decade. The challenges are multiple and enormous. They are both domestic and regional and the two often are inseparable. The list is long and includes managing almost impossible demographics; cementing national identities; institutionalization and political reform that need not endanger the longevity of ruling families but will have to involve accommodating a citizenry that wants to see greater inclusion, involvement in the political process, transparency and accountability; transition to truly diversified, post-oil economies; and adjustment to a Middle East in which Iran with its history and sense of empire, huge population base, and an economy that after several years of deep structural reform is likely to be alongside Turkey one of the most vibrant in the region. Gulf leaders appear to be still grappling with the enormity of these challenges. They have yet to reveal statements of vision that address the full gamut of issues they will have to confront. Dubai, Qatar and Oman, despite concerns about transition to a post-Qaboos era, are furthest down the road in addressing at least some of the issues. In doing so, they hold out the promise of being best able to manage multiple processes of almost simultaneous political, social and economic change.